Basantha Utsav, a feel of zephyr crosses you when uttering this word. The ancient and famous hindu festival being celebrated in India and Nepal for many centuries which is quite popular among the youth of today is the Holi Festival. It also bears the names as “Festival of Colours” and “Festival of Love”. It is also celebrated as an act of gratitude to the nature for a good harvest reaped. Holi festival generally falls at the end of winter and start of the spring. In order to welcome the spring season after a severe winter, the festival is celebrated. In the Gregorian calendar, the festival falls at the end of February or during the mid of March especially on a Full moon day. Initially, it was a culture only in India and Nepal. But, as the world has become a global village now, Holi is celebrated across caste, creed and religion. The objective of the Holi festival is to spread love and repair the broken relationships and enjoy the life with love, frolic and color. The rituals start at the night before the day of Holi. It is named as Holika Dahan. The people assemble around a bonfire and pray to God that the evils in their mind should be destroyed. This is correlated with Holika , sister of the demon King Hiranyakashipu, who was killed in fire. This legend can be referred from Vishnu purana and other epics describing the story of Hiranyakashipu, Prahaladha and Lord Narasimha. In South India, Holi is celebrated exactly on the 40th day from Basanth Panchami and the celebration is named as Kama Dahanam meaning killing the worldly desires in our mind and guiding us to attain sanctity, The bottom-line of this religious celebration is to create and develop harmony among the people despite the differences. 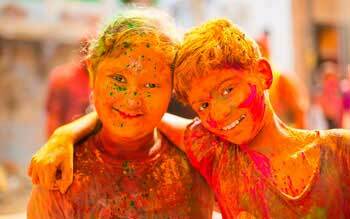 Once the religious rituals are over, the actual celebration starts in the morning on the day of Holi. As it is aptly termed as “Festival of Colours”, everyone smears colours on others as an act of affection and joy. You can see people using water guns and balloons filled with colours spraying on each other. Dry powders are also used. Bands of music and dance are performed when the celebration progresses from one place to another. This continues till the evening with lot of delicacies shared among the families. In the evening, people wear clean clothes, visit families and friends for rejuvenating and strengthening the relationships. Holi is celebrated in different names and forms across the states of India.The tradition is diasporic that it finds an important place in the lives of Indian migrants living in USA, Malaysia and France. Thus, Holi is a colourful celebration making everybody joyous and harmonious and peaceful.